New York: The annual Amazon.com Inc. shareholder letters from CEO Jeff Bezos are eagerly awaited in Silicon Valley for pearls of wisdom from the world’s richest man and an admired business leader. This year’s edition was extra revealing, although maybe not in the way Bezos intended. Bezos’s latest letter opens with the first-ever disclosure of Amazon’s total share of sales from the merchants that use the company’s e-commerce sites as a sales conduit. The company has long said that those merchants sell about half of the individual items sold on Amazon, but it has never given their contribution to the total value of physical merchandise sold on the site. That number — a common e-commerce metric known as gross merchandise volume — has always been a secret at Amazon. Not anymore. In 2018, Amazon’s nearly $300 billion in GMV was about a 19 per cent jump from the prior year. That was notably slower than the rates of increase of 24 per cent and 27 per cent, respectively, in 2017 and 2016. It’s hard to explain the slowdown in Amazon’s merchandise sales growth. If anything, it seems as if Amazon is grabbing a larger share of e-commerce sales and that the internet is stealing more sales from physical stores, which have accounted for something like 90 per cent of all US retail sales. And yet Amazon’s retail sales growth — although still impressive — is slowing noticeably. For context, total e-commerce sales in the US rose about 14 per cent in 2018, according to calculations from figures released by the US Census Bureau. Amazon generates a large majority of its sales in the US, and it’s somewhat surprising that Amazon’s online sales aren’t growing that much faster than the e-commerce category. Of course, it’s unfair to expect Amazon to grow like a start-up forever. But it’s not insignificant that this slowdown has come even as Amazon has attempted to flex more muscle in newer categories. The company has made a big push into home furnishings, launching private label brands intended to compete with the likes of Wayfair Inc. and West Elm. It also continues to expand its selection of owned brand apparel and has been lining up more marquee names to sell clothes on its site, including J. Crew Group. And with the expansion of its Prime Now programme for items that people want delivered immediately, the base of consumers that can buy groceries online from Amazon is growing rapidly. These grocery efforts are particularly important because the category is among the fastest growing in e-commerce. All of this is to say that Amazon, in theory, is competing for a greater share of the total retail market than it was even a few years ago. And the slowdown in growth looks more concerning against that backdrop. It doesn’t seem like a coincidence that this comes as its legacy retail competitors finally seem to have awakened and adapted to the e-commerce era. 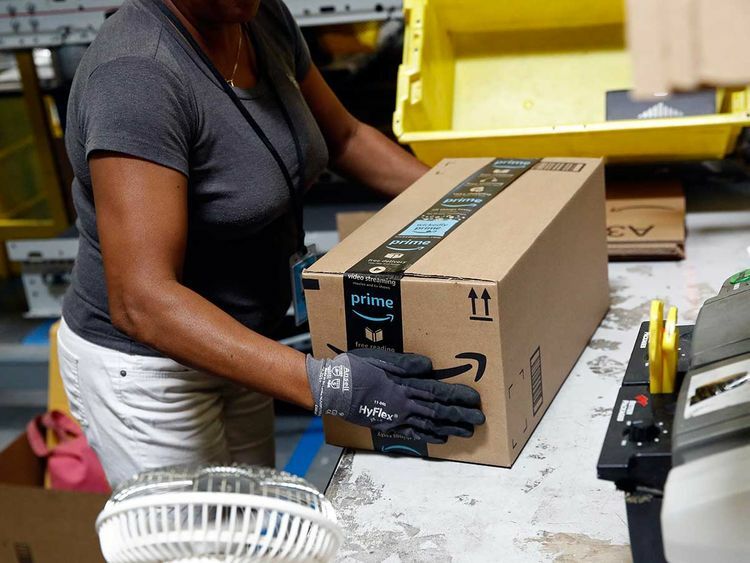 The two-day Prime shipping that used to distinguish Amazon from the pack? That’s routine now from the likes of Walmart Inc., Target Corp. and others. And big retailers are getting good at digital options that Amazon can’t provide as easily, such as click-and-collect. Lowe’s Cos., for example, says more than 60 per cent of digital orders are picked up in stores. Brick-and-mortar retailers have stepped up their digital game. Amazon doesn’t have a cakewalk to growth anymore.